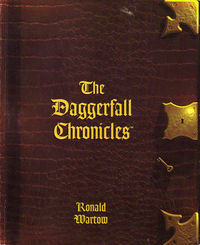 The Daggerfall Chronicles is the official strategy guide for The Elder Scrolls Chapter II: Daggerfall written by Ronald Wartow and published by Bethesda Softworks in 1996. The guide contains hints, walkthroughs and dungeon maps, as well as a unique overview of the game's lore. 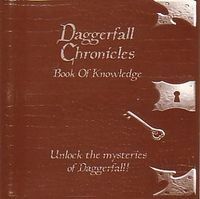 Daggerfall itself came with a sheet of paper, folded down to the size of a CD and used as the inlay in some editions, that acted as an advert for The Daggerfall Chronicles, entitled Daggerfall Chronicles Book of Knowledge. One side contained a walkthrough for the Privateer's Hold dungeon taken from the book, while the other side contained the description quoted below, a listing of what the official game guide has to offer, and information on how to order the book. This page was last modified on 19 November 2018, at 04:20.